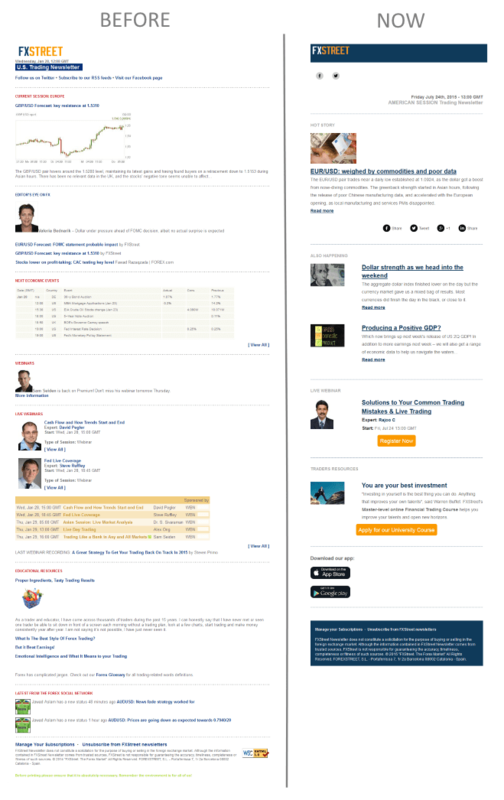 If you are a subscriber of our Trading Sessions Newsletters, you already know it: a few months ago, we revamped our long-time existing European, Asian and American trading sessions newsletters and “Forex Informer” (now called “The Week Ahead”). And by looking at numbers, we can say they are better and subscribers find them more interesting! We reformed our newsletters content and adjusted their schedule so they are sent at the best moment – at the beginning of each trading session. They are much shorter, focusing on 3 hot stories and a webinar. FXStreet has much much more to offer to traders than just 3 articles and a webinar of course, but our goal with this new version was to get straight to the point. These daily “Trading Sessions Newsletters” give a clear and short overview of what is happening and what is going to happen when the bell rings in London, New York and Tokyo. “The Week Ahead” newsletter is similar to these daily newsletters though it additionally includes a list of the economic events to pay attention to during the coming week. It is sent on Sunday evenings (European time). The second part of this project was to use a new layout – the design of our newsletters was not in line with our website design anymore and it was about time to update it! The new layout, which is clearer to read, includes biggest titles and more images, was launched in June. On top of that, and it was very important for us, it is responsive: it can be displayed correctly on any device, computer, tablet or mobile phone. We plan to improve these newsletters in the future and add a few new things, but keeping them clean and short, as numbers so far have proven our readers like the reform. We want to avoid the syndrom of adding this and that and later on this small cool thing, making the final email a hotchpotch of content that is too busy and not appealing (even if the content you put in there is of great value!). Also, in the months to come, our plan is to create other newsletters about other specific types of content. So grow the amount of newsletters, not the quantity of information in each newsletter. Every trader would be able to choose among many newsletters options to be informed about what matter to him/her, instead of receiving one email that includes a wide range of content that might not be of his/her main interests. We hope this is the right path, we are confident it is. Send me the Newsletters of Forex market to my email id pls.